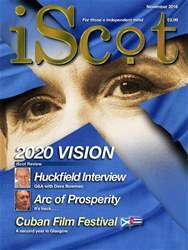 SOME EIGHT years ago at Harvard University Alex Salmond, then First Minister, described his ambition for Scotland to become a “Celtic Lion” economy. In that speech he suggested that we could join with the other small, dynamic trading nations of northwestern Europe in what he termed an “arc of prosperity;” a crescent of agile and growing economies reaching from Iceland and Ireland in the North Atlantic to Norway and Denmark on the other side of the North Sea. On 15 September 2008 the largest bankruptcy in US history was filed by Lehman Brothers Holdings in New York, exposing a whole raft of critical failures in global financial regulation, corporate governance, and risk management. In doing so he was merely repeating what he had said two years previously in Edinburgh when he suggested that with the right pro-Scottish business policies, lower tax, and infrastructural investment we too can enjoy the same success as our nearest neighbours. While Mr Salmond was articulating this ambition the countries to which he was alluding were all rated in the top six wealthiest economies in the world, but even as he spoke the trade winds were turning.